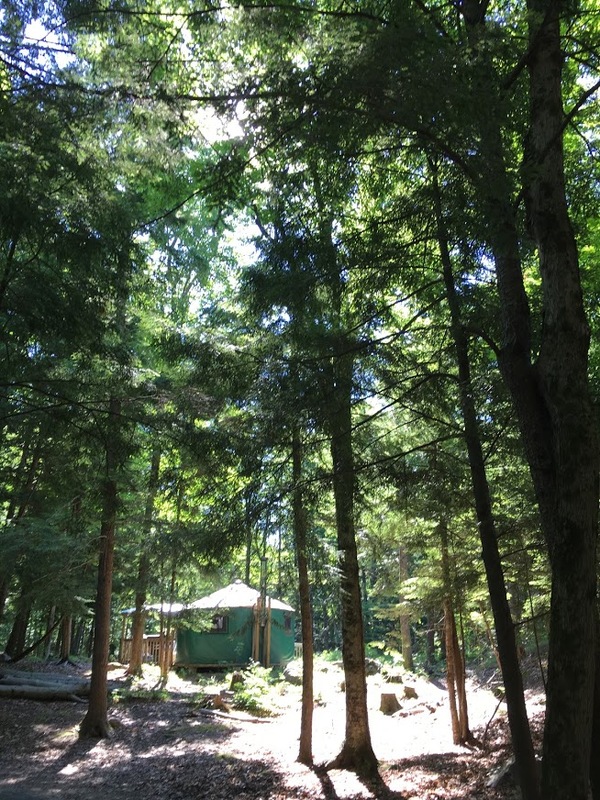 I like camping, and being out in the woods; it’s energizing to be surrounded by trees and water and far away from city life (which I also love, but need a break from sometimes). 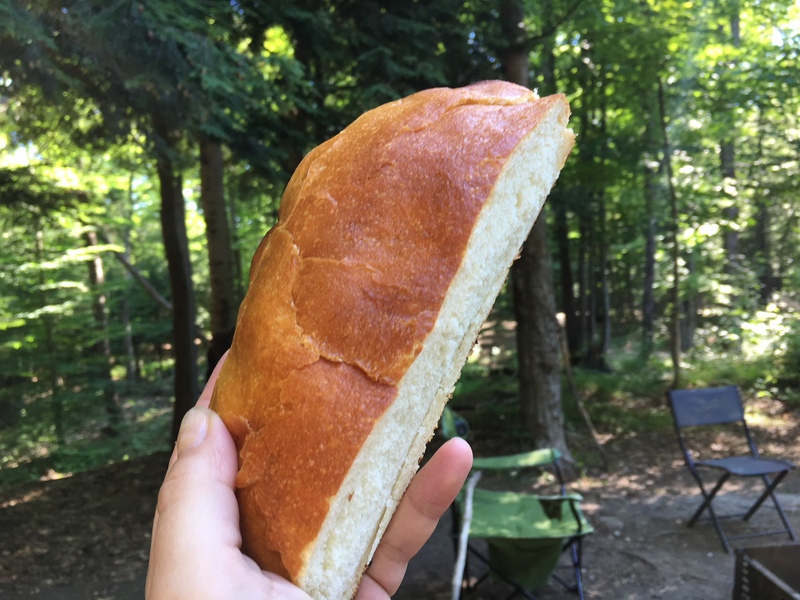 When I was a kid, we used to go to Silent Lake Provincial Park to camp as a family, and we all love it there – particularly because the lake is closed to motorized vehicles, and it’s really peaceful with just canoes and kayaks exploring the lake. 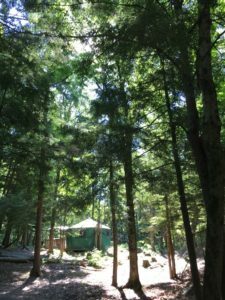 This year, my mom finally organized us into renting one of Silent Lake’s yurts for a few nights, and we headed up in early July. There are lots of attitudes about what counts as ‘camping,’ and I’ve heard them all; amongst properly outdoorsy people, there are lots of snide comments about the difference between ‘car camping’ and ‘real camping,’ and a yurt with bunk beds and a barbeque doesn’t count as ‘camping’ in their books. I think these people are deeply insecure no-fun-nics, so I guess we’re all judgemental people. For me, one of the nice things about car camping is that you can bring things that are non-essential but fun, like my Dutch Oven. I bought it years ago, and it’s been collecting dust in my mom’s back room for ages. I’d been meaning to try out recipes, but it was never convenient to take, so it sat neglected. Until this Summer, when I finally got the chance to use it at Silent Lake! Baking bread in a campfire with a Dutch Oven is almost as easy as making it at home, and because we planned on baking it on our first night, I mixed and kneaded the bread at my mom’s house just before we left. If that wasn’t an option, I would’ve pre-measured the ingredients so that it was easy to put it all together at camp. 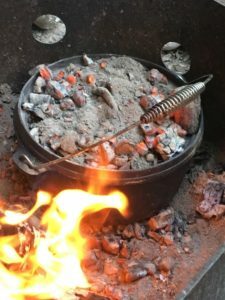 Though some people advocate removing the coals from the fire pit and placing them and the Dutch Oven in a separate tray, I found it was pretty much fine in the fire pit itself; I did leave it an extra five minutes (35 minutes was too long! 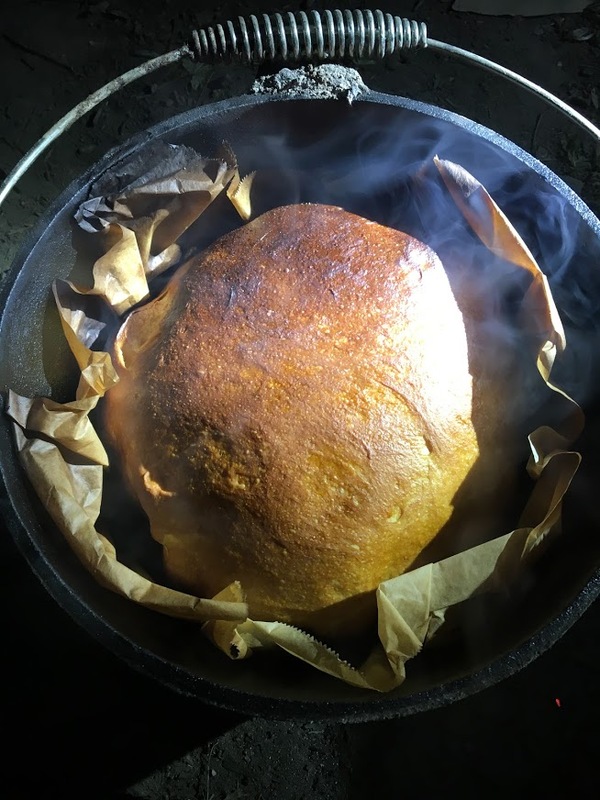 ), which allowed it to burn a bit on the bottom and one side, but I’m proud of it as my first-ever Dutch Oven baking experiment. Recipe below! Dissolve sugar in 1/2 cup warm water in a small bowl. Sprinkle yeast over top. Let stand 10 minutes, then stir briskly with a fork. Add yeast mixture to 1/2 cup warm water in a large bowl. Stir in 2 cups flour, sesame seeds, and salt. Mix until smooth. Gradually add enough of the remaining flour to make a moderately stiff dough. Turn dough onto lightly floured board and knead until smooth and elastic (about 10 minutes). 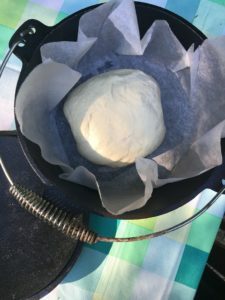 Place dough in a lightly greased warm bowl; grease the top of the dough by turning it over once or twice in the bowl.Cover with wax paper and a clean towel. Let rise in a warm place until doubled in size, at least 1 hour. 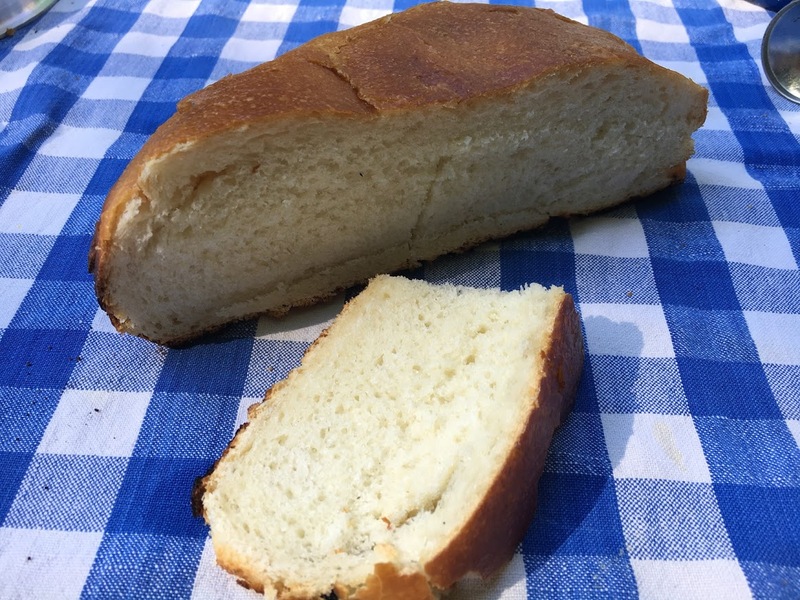 Punch down the risen dough and place it in the Dutch Oven. Cover with greased waxed paper and let rise until doubled, about 1 hour. Build a fire; getting to a point where you have an appropriate amount of coals will take approx 45 min to an hour. Coals are pieces of the firewood that have broken up into pieces; the wood is mostly charcoal, but they are still on fire and emitting heat. Once you have enough hot coals (approximately 8 or so for the bottom, 8-10 for the top), make a level space in the firepit and place about 8 coals there. Remove waxed paper from the dough, and place Dutch Oven lid on top. Carefully place the Dutch Oven on top of the coals. Bake 25-30 minutes until golden. Take care in removing the lid – it’s easy to get ash from the coals into your food. Remove bread from Dutch Oven; allow bread to cool and serve!